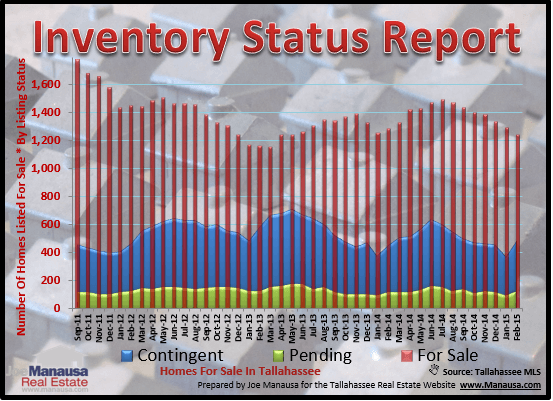 It's been a long time coming, but the number of houses for sale in Tallahassee in many price ranges is not enough to fill the growing demand from homebuyers. For those people looking for a home to purchase below $300,000, the relative supply of homes is at its lowest level since 2006. This means that buyers are likely to be bidding against other buyers for the best-priced homes on the market. The graph below shows the total number of homes for sale each month, with those that are already under a contingent contract with a buyer shown in blue, non-contingent contracts are shown in yellow, while those that are still available are shown in red. Twenty eight percent of homes that are on the market are already under contract, so when we combine the current rate of sales with the upwards spike in homes under contract, we’re left with a market where buyers are competing for the best priced homes available. Recently, we received multiple offers on several of our listings, and in one case, a buyer was willing to enter into a back-up contract with the seller in case the first buyer was not willing or able to consummate the sale. These are the types of situations that often occur during a seller's market! As a caveat, this is not happening in all price ranges, nor in all areas. Overall, the market is reaching a balance, generally showing an over-supply of homes above $300,000, and an under-supply of homes priced below $300,000. Home Sellers—if you are not getting offers, you are over-priced! There are plenty of buyers in the market, at all price ranges. If nobody is making you an offer, they are giving you powerful feedback about your current expectations. Home Buyers—if you like a home and you know it’s a good deal, ask your buyer’s agent what the most prudent offer would be. Don’t be surprised at some price ranges in NE Tallahassee if the best offer is above the full asking price! Buyers are finding that they have to compete for the best homes available. Need personalized advice? Just drop me a note and we'll be in touch as quickly as possible.